It's been written that when Life Magazine photographer Eric Schaal visited the Carters in Maces Spring in 1941, the girls did cartwheels and handstands to show off for him. 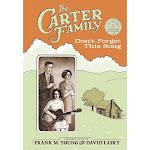 Frank and I depicted it briefly in our graphic novel, "The Carter Family: Don't Forget This Song." But until now, I didn't think Schaal had taken any photos of the girls. I thought I'd seen all of his shots, via Life Magazine's online photo archive. Well, imagine my surprise today when web searching for photos from the shoot, and there is Anita Carter (credited as June, but I think it's Anita) doing a handstand! There were two others featuring her acrobatics. All featured in a gallery with a TIME article on the Carter Family from last year. What a fun surprise!